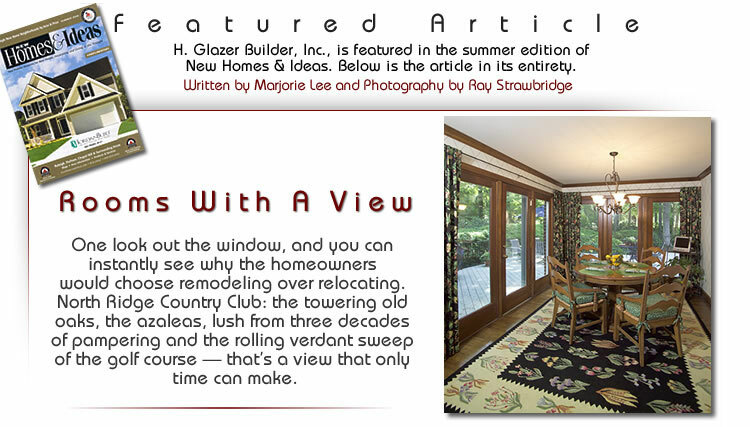 Harold Glazer, founder of H. Glazer Builder, understands the value of that view, maybe better than anyone else around. In the past six years, he has remodeled more than 20 homes in the North Ridge community, and two of this year’s homes earned STAR awards from the Remodelors Council of the Home Builders Association of Raleigh, Wake County as top Triangle remodeling projects. “This really is a unique area of the Triangle,” says Glazer. “People built these homes in the mid-70s, and they’re ready to update, upgrade and expand, but they realize they can’t recreate what they have here anywhere else.” Glazer points out that the value of this property in the Triangle real estate market is such that a homeowner can invest a few hundred thousand dollars in a project and end up with a million dollar property — and enjoy living in a showcase home while their investment just continues to grow. That was the scenario for both of these STAR award-winning homes. Original owners wanted to open up boxy 70s floorplans, update kitchens with the latest bells and whistles, add space and just generally enjoy, through their homes, the rewards of a lifetime of hard work. The Gold award winner for both best kitchen and best bath was a two-story Colonial on one-third of an acre overlooking the 13th green of the North Ridge Golf Course. The retired homeowners had looked around at alternatives and decided there wasn’t anywhere else they wanted to live. They simply needed to make changes that would allow them to stay in their home as long as they could. The kitchen was a dated 70s style (back when kitchens were still in denial about being the true heart of the home), and the homeowners wanted a space where they could be proud to entertain their friends and family. And the master suite, also true to its decade, lacked the luxe amenities that are de rigeur in today’s upscale homes. In addition, the homeowners wanted a downstairs master that would be easily accessible to them in years to come. Glazer gutted the existing kitchen of this home and replaced it with a state-of-the-art showplace, and he added a 1,200-foot wing to include a luxurious master suite and handsome paneled library/home office. He also added a new deck to take best advantage of the spectacular views this property afforded. 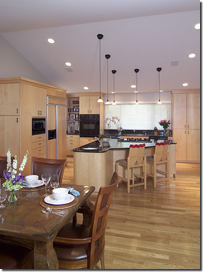 In the kitchen, Glazer replaced tired old oak cabinets with hand-glazed custom cherry cabinetry. These raised panel cabinets feature a host of up-to-the-minute features, like pullout spice racks and today’s furniture-style detailing — fluting, carved corbels and deep crown molding. A decorative paneled hood surround was custom tailored of the cherry cabinetry. New counters are a creamy flecked granite, and the backsplash is imported tile, with a decorative hearth-like mosaic as a focal point behind the cooktop. The kitchen was reconfigured slightly for a better workflow. Old appliances were replaced with the latest sleek stainless steel, including a wine cooler integrated into the cabinetry. A raised counter, with barstool seating was added to the island for casual gathering and eating. 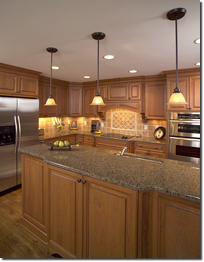 And dated light fixtures were replaced with antique bronze pendants and recessed lighting. The real challenge with this renovation, says Glazer, was the seamless integration of the existing home with the new wing. “The worst thing you can possibly do,” he says, “is to just tack on an addition that looks just that — tacked on.” Glazer was able to manage a transition that is virtually invisible from old space to new. 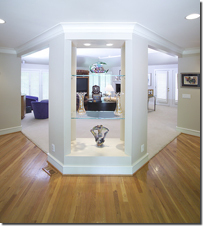 Oak floors were installed in the addition and finished to a perfect match with the medium shade of the old oak floors. A hallway serves as transition between old and new. Trim in this corridor was stained to match the woodwork of the rest of the home, so that standing at either end gives no clue that this space has not always been a part of this home. First stop in the new addition is a cherry paneled home office. The homeowner wanted a true library-like office, convenient to the master bedroom and not just a converted spare bedroom. The same hand-rubbed cherry used in the kitchen was used to outfit this office with a built-in desk, flanking floor-to ceiling cabinets and a wall of bookshelves. At the end of this corridor, is the pièce de résistance of this addition, the opulent master suite. Bathed in soft creamy colors and warm woods, this space exudes luxury and pampering. Glazer credits interior designer, Carmen Hunnicutt with pulling together the plush and luxurious ambience. Custom cherry cabinetry was designed to create a lighted alcove for the bed, extending the length of the wall and incorporating nightstands for a very clean tailored look. The same cabinetry was used for a stepped back custom entertainment center for the opposite wall. An elegant arcing bay, with floor-to-ceiling windows creates a cozy seating area and takes full advantage of the home’s spectacular views. This master suite is not just a pretty face either. The entire addition was wired for high-tech control of lighting, sound system and security. And the enormous his-and-her closets are completely outfitted with built-ins. The luxury extends into the spa-like master bath. The custom glazed cherry cabinetry continues through this space, with staggered-height counters for vanity and sink, topped with solid granite. Creamy 18-inch tile is set on the diagonal and more tile, with decorative accents, graces the walls, the garden tub surround and the oversized, glass-walled shower. A doorway from the master bath leads to a private deck — a hot tub retreat. Glazer added another 500 square feet of deck at the back of the home with room for entertaining and dining al fresco. Glazer’s second award-winning North Ridge remodeling project was likewise for the home’s original owners. This couple was especially dissatisfied with the boxy closed in rooms that made up their 3,300-square-foot contemporary ranch but loved their incredible long-range views of the golf course and exceptionally private lot. They wanted air and space and flow, and they wanted a space open to the kitchen where they could gather with children and grandchildren. 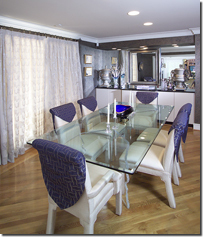 Like Glazer’s other award winning addition, this one included adding a home office as well as modernizing the kitchen. On this project, Glazer completely gutted the existing home. Walls were torn out and moved and ceilings were raised. Floors were replaced and the old deck torn off. As often happens in renovations of this scale, surprises were in store for the remodelor. “You never know what you might find when you tear inside a wall,” says Glazer. “Sometimes you discover it was not built to code and you have to make major repairs.” Glazer credits an atmosphere of trust between remodelor and homeowner when it comes to successfully dealing with the inevitable uh-ohs of large-scale renovations. And he is emphatic that the path to that trust is a history of communication, communication, communication. “It’s a daily, ongoing process of keeping the homeowner absolutely informed about every aspect of the job,” says Glazer. “This kind of careful hands-on management is absolutely critical to a successful remodeling job — really even more so than in new-home construction.” On this project, all of the wiring in the entire house had to be replaced, a job not called for in the original plans. But both remodelor and homeowner persevered and the end result is a spectacular new home, almost unrecognizable from its previous incarnation. Glazer reconfigured the room-after-room all-in-a-row house to one of open airy spaces that flow easily one into another. Beginning with the very first impression, the old cubical of a foyer was blasted out and turned on an angle. From here, the home radiates out, with this juxtaposition of angles creating a strong sense of movement and flow. Oak flooring, in a contemporary natural finish sweeps through the foyer into the rooms beyond. Immediately ahead, the expansive living room (with its new raised ceilings) is separated by a massive built-in angled unit framing open glass shelving and displaying the homeowners’ collection of glass sculpture. This truly dramatic architectural element sets the contemporary tone for the entire home, serving to define the living room and foyer spaces, without closing them in at all. Super-plush cream-colored carpeting soothes the living room with its eclectic mix of traditional and modern furnishings, artwork and family portraits. Again, Glazer credits the interior designer, Judy Pickett with pulling together the overall look that the new spaces made possible. Black granite and smooth ultra-wide white trim surround the fireplace for a clean, contemporary look. Multiple French doors open to the deck and the breathtaking views of the golf course. Adjoining the wide-open spaces of the living room and foyer, the dining room, while still open to these rooms, is a more intimate space. Dark marbleized walls and lighted buffet alcove, appointed with sleek contemporary black and white cabinetry and mirrors, give this room a distinctive Art Deco flavor. Fanning out to the left of the foyer, a bedroom wing terminates in the completely updated master suite. This spacious room takes full advantage of the natural setting with a bank of windows along one wall. A sitting area and large entertainment center make this an inviting space for quiet secluded lounging as well as sleeping. Glazer created a new master bathroom for these homeowners that is all Hollywood glamour. Black and gold and curvaceous lines fill this space. Plush carpet, highlighted with a single dramatic swirl of black and cream sweeps into the room. 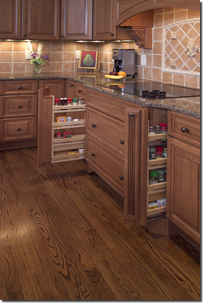 Glossy cabinets float on the walls, with stylized rounded bottoms. And the huge walk-in closet is fit for a Hollywood starlet too. Radiating out from the foyer in the opposite direction, are the newly updated kitchen and breakfast area and the added great room and play room. Here again, Glazer used juxtaposed angles to create movement and flow. The completely open kitchen features a huge pie-wedge island, whose curving face fans out to visually embrace the entire space. The new kitchen was appointed with contemporary maple cabinets and black granite counters for a very clean modern look. An adjoining alcove is outfitted with matching cabinetry for desk space and an entertainment center. Separating this very large and airy kitchen and casual dining space from the newly added great room is a huge aquarium, flanked on either side by wide openings. Much like the custom display case in the foyer, the aquarium ingeniously defines the spaces without sacrificing the open flow. Architectural detailing like a deep tray ceiling with recessed lighting and a custom built-in entertainment center give this new room — a gold STAR award winner — both substance and interest. Tucked off the side of the new great room, is a sky blue playroom for the homeowner’s beloved grandchildren. This space is set off just enough to obscure the typical plaything clutter, while still allowing little ones to be close to the center of everything.